Currently, Play station users are not able to Download Themes which they have bought. Each time users try to download themes, an error occurs which says Code CE-38606-3. The Code Prevents the download and adds the Frustration in PlayStation users. PlayStation users are not able to Download themes for Battlefield, Star Trek etc. The error will read as "Cannot add the following content to [Downloads]. An error occurred on the server. (CE-38606-3)"There are few solution to this problem scatters all over the internet. We will try and bring them in one place which is on this page. Most of the time when tons of users get a same error code on PlayStation, Server is the issue. More time then not, one can easily assume that its the server which is the culprit and nothing from the user side. But, there are certain things that you can perform and make sure the issue is not from your side. Our Research on Forum posts have shown that Restoring the licence might just work for you. This method is not a sure shot one which will fix this CE-38606-3 error but you can always try it. Doing this will may fix the issue where you are not able to Download Themes. Method 2: Open PlayStation Store Through Theme Settings. Go to Theme Settings on your PlayStation. Click/Select on any theme, There you will get an option to go to PlayStation Store. Once, PlayStation Store opens up, Try to Download your Theme from there. If Above mentioned methods don't work for you Specially method #2 then you can be quite sure that the problem is from Server side. This is what the error page says at least. Guys at PlayStation would be already working on the issue. 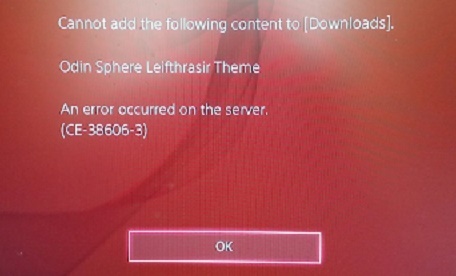 You can wait until this is fixed to download your purchased themes on PlayStation. I hope it will download automatically once themes are back up cause i checked the library and purchases for the themes and they werent there. Obviously not gonna be in my library as they could not be downloaded but i was kinda syked for my new nhl17 and cod themes. Shucks. PSN is at it again. I went to playstation store website and signed in. Once signed in I clicked on my user name and then clicked on "download list". It should display all your content, themes etc. that you had previously tried to download. Simply click download to your PS4 or retry. Turn on your PS4 and it should hopefully begin downloading straight away. This is how I fixed my issue and hope that it will help to resolve yours too. Hey EVINKAY, Thanks for your Suggestion. This will help others too.